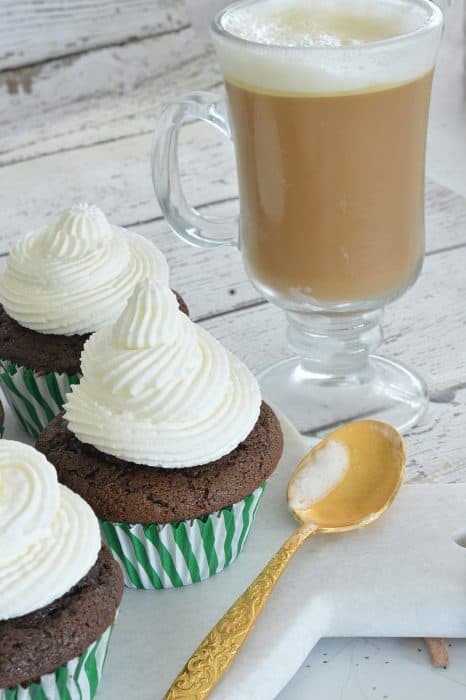 These Irish Coffee Cupcakes are the perfect sweet treat for St.Patrick’s Day. Serve with a cup of tea or the traditional Irish Coffee for an extra special touch. St. Patrick’s Day is around the corner and you know that makes this Irish girl just the littlest bit homesick. After spending Christmas at home in Ireland being spoiled with my mom’s delicious home cooking, this upcoming holiday definitely makes me crave all things Ireland – stew, brown bread, Irish tea and of course, a good Irish coffee. And no, Shamrock Shakes and Corn Beef & Cabbage are not the Irish staples I will be consuming! ;-) And while we’re at it, if you claim Irish heritage please don’t embarrass yourself by saying St. Patty’s Day. It’s St.Patrick’s or Paddy’s. Please get it right! I don’t really drink alcohol much these days but when you’re Irish you need to know how to make a decent Irish Coffee. Even if it’s just for guests. Or your husband. It’s super simple to make (and doesn’t include Baileys – that’s an American twist I believe!). All you need is coffee, sugar, Jameson Whiskey and some good fresh whipping cream. Sounds delicious right? 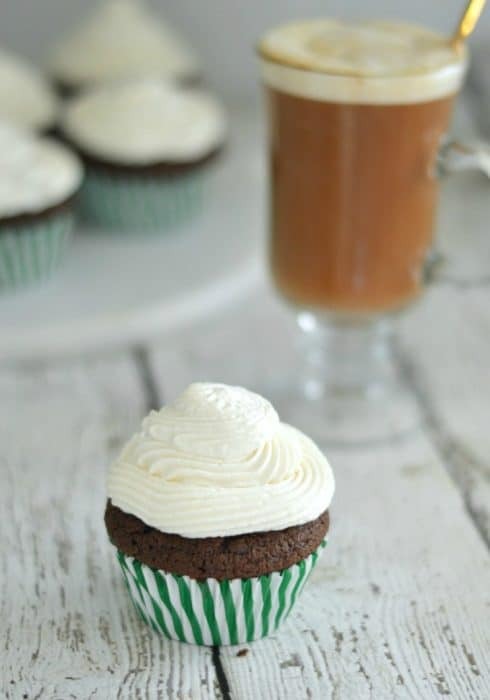 Well let me share something that’s even more delicious – an Irish Coffee Cupcake! When Wayfair contacted me to participate in their Cocktail to Cupcake campaign, I jumped at the chance to take that beloved hot Irish drink and impart all those flavors into a decadent, sinful (and definitely not kid-friendly) chocolate cupcake. devine. I previously used it for my Chocolate Salted Caramel Crunch Cake which it was a huge hit. In the spirit of all things Irish, the stout I’m using is of course, Guinness. This rich beer, along with cocoa powder and extra bold coffee really sets this batter apart from others I’ve had. Of course you can’t have an Irish Coffee Cupcake without whiskey and cream. 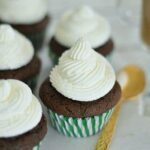 These cupcakes are filled with a sinful whiskey ganache and then topped with sweetened whipped cream. Perfection. Pair this sweet treat with a cup of hot Irish Coffee and you’ve got yourself a little bit of Irish heaven. I’ll admit these are a little bit more labor intensive than your average basic cupcake. But trust me, they are worth the effort! Place 24 liners into 2 cupcake pans. In a large saucepan heat stout, coffee and butter together until the mixture comes to a gentle simmer. Add cocoa powder while whisking continuously to avoid lumps Beat until smooth. Put it in the fridge to cool. Blend flour, sugar, baking soda, and salt in a different bowl. In a third bowl, mix eggs, vanilla and sour cream with an electric mixer. Once chocolate mixture is cool, add it to the egg and sour cream mixture. Mix them together. Add flour mixture a little bit at a time and beat on low speed until combined. Divide batter between 24 cupcakes - filling 2/3 of the way. Bring heavy cream barely to a boil. Remove from heat and pour over chocolate morsels. DO NOT MIX. Put a lid over it and let it sit for 5 minutes. After 5 minutes, whisk the mixture - starting from the inside and working your way out. Add the whiskey and mix to incorporate. Let sit for 10 minutes at room temperature to thicken slightly. Once the cupcakes have cooled, cut out the center of each cupcake using a knife or apple corer. Be careful not to cut a hole in the bottom. Fill with ganache and replace the piece of cake you removed. Pour cream into a bowl along with the sugar. Using an electric mixer, whisk until the cream forms stiff peaks. Spoon into a piping bag and pipe with a large star tip.